I purchased a double-bladed dovetail plane from Clarence Blanchard of Fine Tool Journal some time ago. Clarence assured me that while the plane is not a showpiece, it is a good user...and he was right! once before with just a saw and chisels, so I've been looking forward to dusting off my dovetail plane and using it for the first time. Without any sharpening or honing, you can see in the first & third photos how well it cuts pine. Pretty impressive! It will require some sharpening, however, for the curly cherry —a harder wood with ornery grain—that I'm using for the sawbuck table. The plane is double-bladed to accomodate reverse grain on a board's edge, but since the pine cut so easily, I sheared both sides of the profile (using both blades) without removing the board from the vise or changing my stance. I don't know if that's the "right" way to use the plane, but it worked great. In the last two photos, arrows are pointing to the areas of the blade that do the actual cutting and the only areas that will need to be sharpened. The dovetail joint has been around since the ancient Egyptians, 5,000 years ago, but I do not know when sliding dovetails were first introduced and when dovetail planes were first developed. If you happen to know, please email me or post a comment (Gary—nudge, nudge). I'd love to have more information. That is pretty cool! Nothing turning at 22,000 ROM, and no hearing protection required. 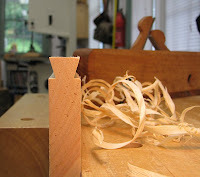 Early sliding dovetails: As long ago as early 18th century? Beautiful tool! Just awesome. I have used one before and it is a joy to use! I'm not sure of the history of the joint but I know that the Japanese have been using that joint as well as a version of the dovetail plane for quite a while! I can just hear those shavings now. That is one different looking dovetail plane! I've never seen the like. I've got two, one an older Ulmia and the other a no-name Dutch version. Both have the typical sliding stops to govern width of cut. Knickers too. Yours looks as if a woodworker put some serious thought into the process of cutting a dovetail and produced a very workable design. Where in the world do you get your hands on these great finds? Wow! Impressed as always. Great to see woodworkers who want to find and try hand methods rather than immediately pick up the 22,000rpm devices. No wonder you have such a great range of skills. I'll be interested in how it performs in harder and crankier woods. We should think about some posts on Egyptian woodwork some time. The few images I have tucked away indicate a very sophisticated aesthetic. Now that is pretty darn slick. Honestly didn't even know they existed, lol. Thanks for enlightening me. Al, thanks for the links! According to the second article, sliding dovetails have been around at least as long as 399 B.C. That's amazing. Adam, it is indeed a fun tool to use! Gary, did the knicker cut the shoulder for the sliding dovetail? I'd like to see a picture of that. Vic, check out Fine Tool Journal for antique tools. Clarence has good prices and good products. Marc (Woodwhisperer), I had never seen a double-bladed one before. Whoever made it was a very clever fellow. The two blades are set at different angles but they both cut the same profile. That kind of geometry gives me a headache! Here's a page of the Ulmia Dovetail plane. The other no-name plane is similar, but narrow, with a wood fence and no knicker. The blade on the second plane is quite thick. I'll get a photo of it shortly. That is a different way to set up a dovetail plane. I've never seen one like that. I've only seen the ones mentioned earlier in the thread which work 90 degrees to the way yours does. Math wouldn't have been required to make the blades... the maker would have stuck the blade into the plane and just scribed a line to mark what stuck out past the central dovetail section. Thanks for the link, Gary. I have only seen one other dovetail plane and it looks like mine, except with one blade and a sliding fence. I have never seen one that rides on the face of the board. Metalworker Mike, what you can't see in the photos is that the blades are also skewed. And you're right, it's not really all that hard to make them, it just takes some careful layout and cutting. What is the angle on the dovetail that your plane cuts? I look forward to seeing your description and illustration of how you choose to cut the socket, groove, female part, or whatever the big kids call that section of the joint (assuming that you don't use an electric router). 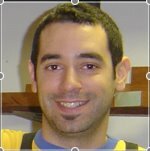 Thanks for your blog; you do a great job. Phil, it's approx. a 73º angle. I laid my dovetail markers alongside it and the angle is greater than a 1:8 ratio. This is so cool! I did not know that these were out there, and what a great history lesson just by reading the comments. Kari, this is a great blog that attracts some smart ones! All I can say is I want one! I've been working with sliding dovetails for table top attachment as well. And want to go the way of handplanes for the application, as my router isn't providing the precision I want for good fit. I've been making reproduction 15th Century tables. One such is similar in construction to the trestle table visible in your workshop tour video. Might you know the provenance of that table? Jeff, 15th century tables sound cool--where are you finding the images/plans for reproduction? The trestle table I'm building is an 18th c. PA German German sawbuck table that is housed at the Landis Valley Museum. I've only used a plan for making reproduction period furniture once, and had a bad experience. So, I really don't trust patterns much. It's slower, but more satisfying than using patterns. Especially as the guys making the patterns may tend to interpret for producability using modern methods, or for use of certain types or dimensions of lumber. Or they are just plain not good at making patterns. I travel in Europe a far bit, go to a lot of museums, ruler & camera in hand, and make my own patterns from surviving furniture, or may interpret from something in a painting. Also, some of the better auction houses will post photos of their furniture from different angles, so that gives a decent basis for developing a reproduction pattern. The table I'm working was listed in an auction catalog as being from Aousta, Italy, 15th Century. Jeff, I envy you being able to travel to Europe and see these pieces first hand. Feel free to shoot me some photos of your furniture anytime. I'd love to see them. That's how I'm building the sawbuck table--from a photo. I couldn't get close to it at the museum, so I'm just doing the best I can from photos. It's a challenge but pretty fun figuring it out. Hi, Kari -- Sue in Chapel Hill here. I'm really late to this conversation, but trust you to have something valuable to tell and show! In fact this will be an interesting test of whether you can even see a comment on such an old post. I didn't even know there were dovetail planes until I found a discussion of them in Garrett Hack's beautiful Handplane Book, and that sent me in search of them. I'd tried before to cut sliding dovetails with a router and just couldn't set things up well enough for anything but an amateurish fit, and nor was it much fun to do. 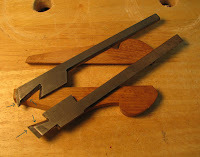 Since I'm more and more preferring to work only with hand tools whenever I can, the idea of trying this with a plane is just thrilling -- thank you for the thoughts about it! Hope you're well and making beautiful shavings! Sue, some companies make new dovetail planes, such as E. C. Emmerich. You can find them at the Traditional Woodworker site. I have not used this plane so I cannot attest to its capabilities. I do own an ECE scrub plane, however, that works great. I wrote a post about cutting the matching groove for the joint. 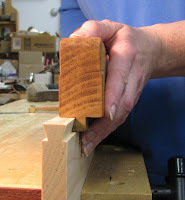 If you do a search on my blog for "sliding dovetail" you'll find it. Initially, I used a bevel block that angled outward from the cut (as shown in the blog post), but have since flipped that block when making these cuts. The sawing seems to work better that way. If that's not clear, let me know. Sue, I found where I wrote about the bevel block being flipped. It's the blog post entitled "Back to the Sawbuck" which was posted on October 21, 2008.